I recently purchased a Netduino Plus, a small (but powerful) board based on an Atmel 32-bit microprocessor with the same form factor as an Arduino. The Netduino can run programs written in C# for the .NET Micro Framework and the “Plus” version adds a 10/100 Mbps Ethernet port, giving you a very powerful network-capable device for about $59 USD. What can you do with it? Quite a lot, actually, as seen in the Project Showcase section of the Netduino Forums. You have access to network sockets via System.Net.Sockets, you can perform HTTP requests via System.Http, and there are even a few lightweight web server implementations available. The only thing I couldn’t find is a library for Twitter. Looking around, I found a project called Tweet Library for Arduino, which sends tweets through an external website, presumably to avoid implementing OAuth on the Arduino. 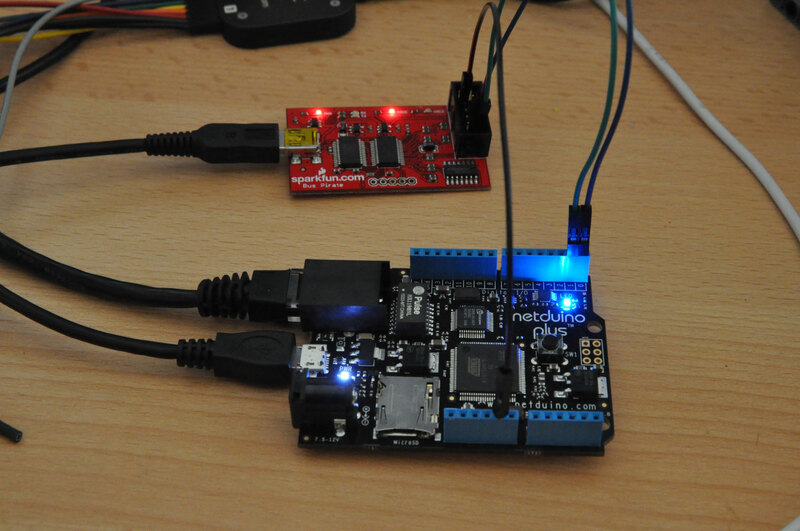 For this project, I decided to make the Netduino communicate with Twitter’s API directly, which means no external websites or proxies are necessary.